Typhlodromus occidentalis is a predaceous mite native to the western United States. It probably moved from native host plants to fruit trees shortly after the latter were invaded by the pest mite species. It has long been observed on fruit trees but before 1951 was identified as Seius pomi. T. occidentalis also goes under the names of Metaseiulus occidentalis and Galendromus occidentalis. Until the 1940s, pesticide sprays aimed at codling moth prevented T. occidentalis from being an effective predator. The greatly improved control of codling moth, scales and aphids after the advent of synthetic organic chemicals in the 1940s and 1950s allowed the fruit industry to focus greater attention on mite problems. Several miticides were used during the 1950s and early 1960s, but the selection of mites quickly developed resistance to each material. Soon the mite problem was difficult and expensive to control, and mite damage was widespread and sometimes severe. On apple, plum, peach and cherry, the most promising biological control agent was T. occidentalis. An integrated program was developed which relied on this predaceous mite for mite control and selective insecticides for control of other pests. Biological control of mites on apples has been used effectively on a commercial scale since 1965. However, the usefulness of predatory mites on pear has been limited due to the harmful effect of chemicals needed to suppress pear psylla. Reduced use of miticides and costs of materials and applications. Less downgrading of fruit due to mite injury. Improved storage life of fruit. Virtual elimination of live mites in fruit calyces and related quarantine problems. T. occidentalis feeds on the spider mites and rust mites that attack deciduous tree fruits, including the European red mites, twospotted spider mites, McDaniel spider mites, yellow spider mites, apple and pear rust mites, Prunus rust mites, and blister mites that are exposed on the surface of the leaf. The egg is oval and about 1/120 inch (0.2 mm) long. It is transparent at first but turns translucent white after a couple of days. 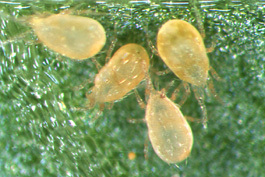 It is easy to distinguish from eggs of the McDaniel or twospotted spider mites which are round and smaller. The larva is wedge shaped with three pairs of legs. It is generally opaque white and about the same size as the egg. The protonymph is oval, about 1/100 inch (0.24 mm) long, and has four pairs of legs. The deutonymph is similar but slightly larger. The adult female is about 1/70 inch (0.36 mm) long and about half as wide and has four pairs of legs. The body is broader toward the rear and tapered at the head. The male is similar but only 1/80 inch (0.3 mm) long. All active stages are opaque white when they have not fed recently but take on the color of the prey for about 24 hours after feeding. 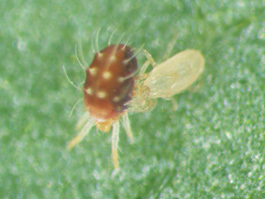 Generally, T. occidentalis can be distinguished from plant-feeding mites by the color difference, the spots on the twospotted and the McDaniel spider mites, or differences in shape. All spider mites are broader at the front, while T. occidentalis is broader at the rear. T. occidentalis overwinters as mated adult females in duff at the base of trees, under bark scales, or in crevices on tree trunks. In mild winters, the females can survive in similar places higher in the tree. Many can be killed in very cold winters, particularly if the weather is dry. Overwintered females begin to emerge at the green tip stage of apple tree development. Emergence peaks between half-inch green and tight cluster stages on apple. The females disperse in search of prey. If spider mites are on the tree, T. occidentalis will be found on foliage of opening buds in the low, central part of the tree. If apple rust mites are the main prey, the females will move to terminals or other areas where these mites are found. They do not seek out European red mites. Females begin to lay eggs at about tight cluster stage. 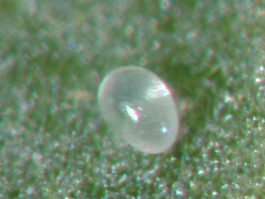 Eggs are deposited on the undersides of leaves, between the leaves of opening buds or on flower parts, and hatch in 1 to 4 days, depending on the temperature. Immature mites are found in the same areas as the eggs. 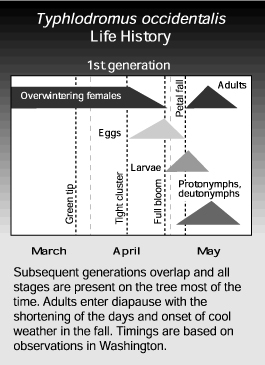 Development time, from egg laying to adult emergence, depends on temperature but averages 6-1/2 days at 75°F (24°C). At this temperature, females survive about 30 days and deposit about 21 eggs. Males survive for a shorter time and consume fewer prey than females. Because of the mite’s rapid development, there can be many generations per year—usually 8 to 10—and good potential for increases in population. Later in the season, T. occidentalis are generally found along the midveins on the lower surfaces of leaves during the day. As the light fades towards the evening, they search the entire leaf surface for prey. During late summer and early fall, some mated females leave the foliage in search of overwintering sites. Others remain on the foliage, consuming the remaining mite prey, and drop with the leaves. Examine the undersurface of several leaves where mites are likely to be. Examine leaves on terminal shoots if apple rust mites are the primary prey or spur leaves if other mite species predominate. The predators will usually be found along the midvein during daylight. Mite and predator densities are usually determined by brushing leaves in a leaf brushing machine. Samples can be taken at intervals to monitor changes in the relative abundance of predators and prey. Leaf samples can also help determine which pest control measures might be causing persistent mite problems. 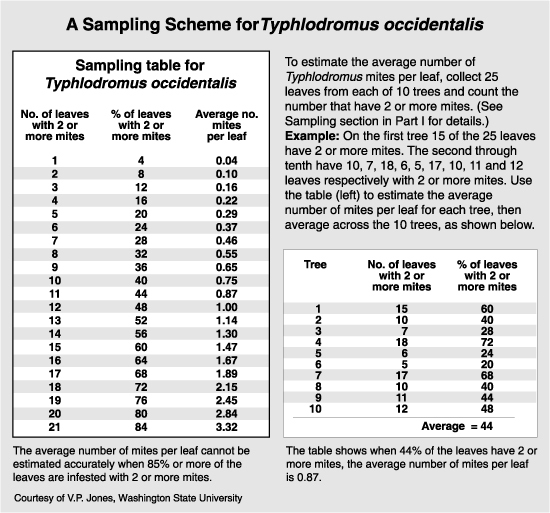 A binomial sampling plan for T. occidentalis is given in the following figure. The sample can be done at the same time as the sample for spider mites. However, look carefully if using this type of sample, as the predator is hard to find and may easily be overlooked. Predator levels of 1 or more per leaf are an indication of good distribution. Mites will usually be controlled within 7 to 10 days if their densities do not exceed 25 per leaf. Number of prey – Since apple rust mites usually become numerous during May and June, numbers of predatory mites can increase rapidly during that period as they feed on the rust mites, reproduce and disperse over the tree. T. occidentalis usually does not control rust mites but will reduce their numbers. As moderate populations of apple rust mites do little damage, it is not advisable to control them unless numbers are extremely high because they help stabilize biological control of the more damaging mite species. Large numbers of predators in May and June prevent the build-up of spider mite and European red mite populations. If the number of rust mites is low in the early season, predator numbers will also remain low, and populations of other mite species can grow before the predators respond. Though acaricide applications may not be directly toxic to T. occidentalis, they may starve if their food supply is destroyed. Winter mortality – Cold, dry winter weather can drastically reduce the numbers of overwintering predators. However, if there are plenty of rust mites as food, populations can build up again within several weeks. Toxic pesticides – Applications of pesticides that are highly toxic to predators have the most devastating effect on biological control of mites. High spider mite populations can develop during the several months it takes for predator populations to build up again after the pesticide application. It is important to conserve T. occidentalis and manage apple rust mites properly. If no T. occidentalis are in the orchard, it may be due to use of a nonselective pesticide. To help establish biological control, eliminate the pesticide from the management program and bring foliage with predators into mite infested areas. 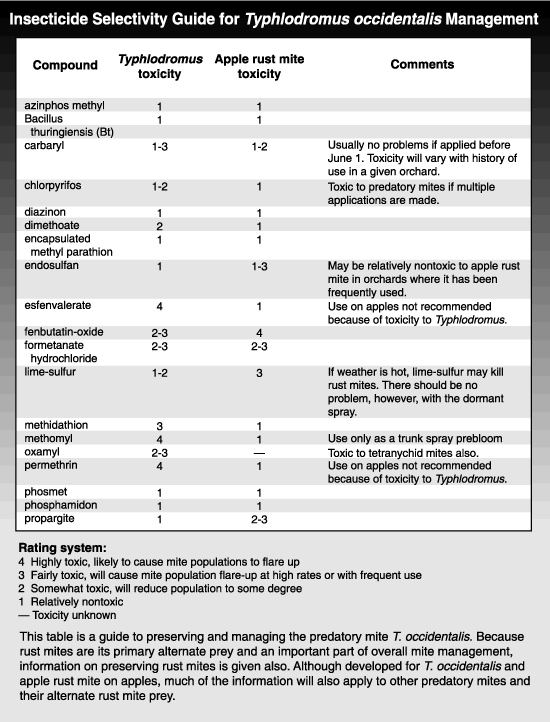 If acaricides are used, it is best to apply them before introducing the predators and only introduce the predators where mites have survived the treatment.